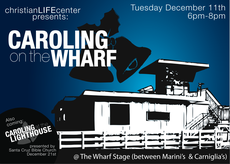 We’re one week away from our Caroling on the Wharf event. And I have a lot to do to get ready. Which also means it’s time to give it a go with a second mailing. We seemed to get a pretty good response from the first one, so here we go again. 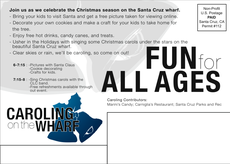 The first one we did was for Harvest Festival and I shared our mailer piece here. I was stoked with and look forward to getting out to the community. Joel has his own company, two of twelve art design, 2//12, he’s been using to do some graphic design work. Here’s his portfolio. You need him. Go hire him. Now I’ll spend a lot of time this week getting the rest of this event together so the outcome is as good as the print piece!